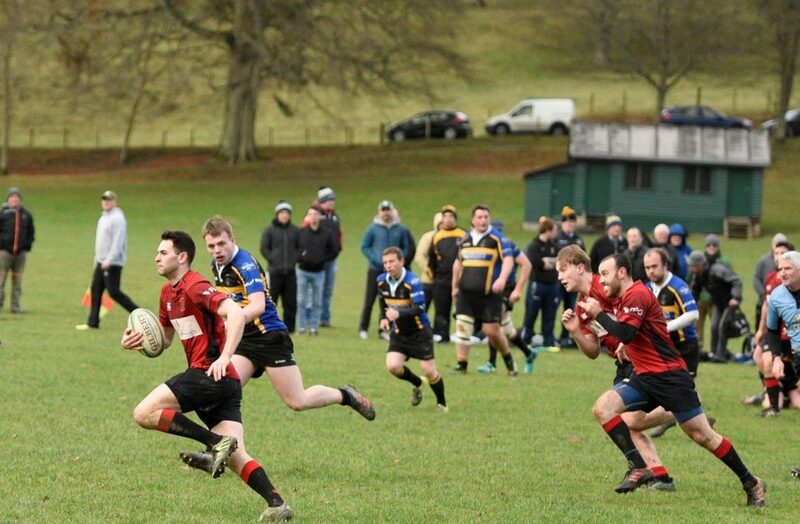 The Reds made the journey to Wilton Lodge Park in Hawick to face the team lying 3rd in BT East League Division 1. The home team had the advantage of playing down hill with a strong breeze behind them in the first half and scored a try within the first 10 minutes. Their number 10 added the conversation with a fine kick from the touchline. The Reds responded well and for the next 20 minutes held the upper hand with some excellent forward play with strong scrimmaging and clean lineout ball being obtained. This allowed positive running in particular from Ross Tulloch, Stuart Cunningham and Rab Cairns who all punched holes in the Hawick defence. The visitors were rewarded with a solo try by Jack Frame who stepped his way through the defence and cruised in under the posts for a try which he converted himself to level the scores. Frame added a penalty soon after and with minutes Neil Lockhart breenged through the home defence and when the ball was recycled Jack Frame was stopped just short of the line but Stuart Cunningham was on hand to take the popped pass and cross for an excellent try. Jack Frame added the extra points to give the visitors a 17-7 lead as half time approached. However a familiar story unfolded over the next 15 minutes where Hawick took advantage of the Reds defensive frailty to score 26 unanswered points. 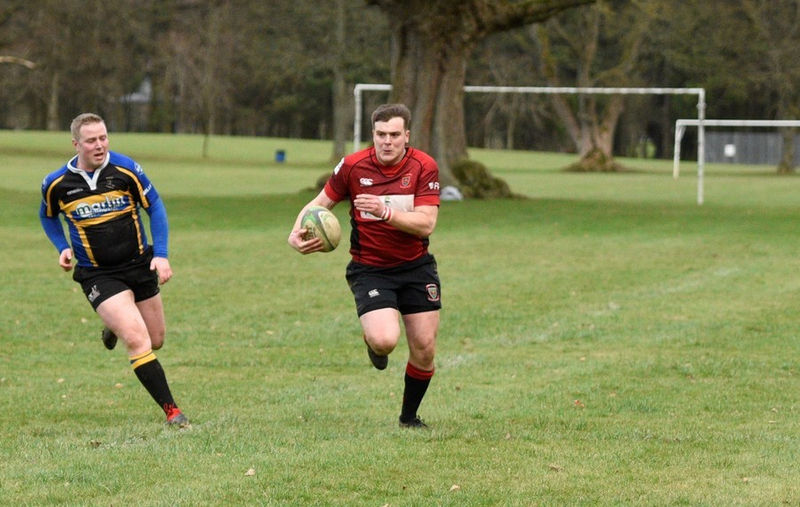 With the score at 33-17 for the home side it was an uphill battle for the Reds to recover, however they did reply with a try from Cammy Murrie after good pressure near the Hawick line. 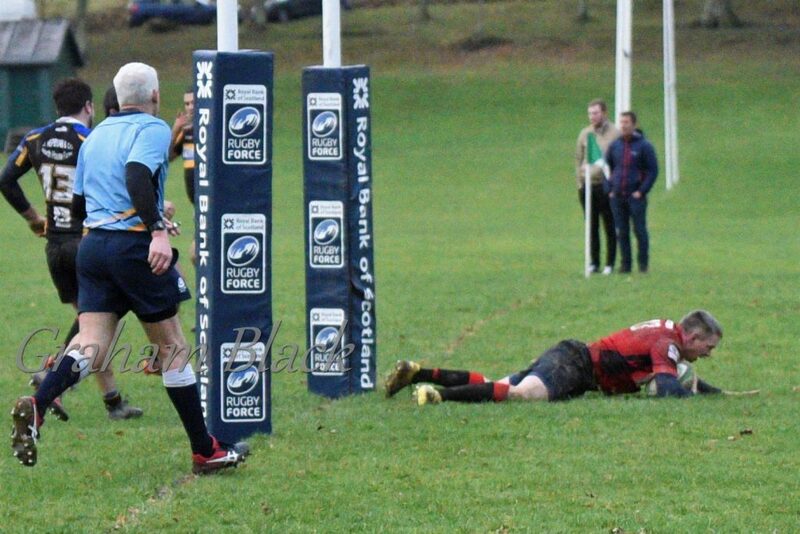 Jack Frame converted the try and added a penalty to take the score to 33-26 however Hawick also kicked a penalty before Rab Cairns burst over for a try near the posts which he converted himself. With the score at 36-34 in favour of the home team and only 1 minute to go, the Reds were unable to score the winning points and the game ended with a very narrow home victory. Although the Reds got 2 bonus points from the game for scoring 4 tries and losing by less than 7 points, it felt like an opportunity missed to gain 5 valuable points. There were great performances in the forward pack to secure clean scrum and lineout ball and they put huge pressure on the Hawick scrum in their most dominant performance of the season so far. The backs ran with purpose but occasionally they failed to be clinical enough with their finishing. The lapses during the period when Hawick scored many of their points have become a regular feature and the Reds need to exercise more control in such situations. The decision making and tactical awareness also need to be sharpened up and the coaches’ frustration on the touchline was very evident. The small but vociferous travelling support were equally frustrated by the missed opportunity for a victory but, on a positive note, the team controlled much of the ball during the game and just need to cut out some basic mistakes and be patient when in possession and work to create the openings. Next week sees the visit of league leaders Berwick to Mains Park but the home team should be confident of putting on a good show and pushing hard for victory based on the many good things they did at Hawick. The 2s will also be at home and will hope for a full squad as they take on Jedforest 2s in a reserve league match. Jack Frame; Lewis Herdman, Rab Cairns, Ross Tulloch, Ross Plenderleith; Chris Ronalson, Cammy Murrie; Ally McLean, Stuart Cunningham, Colin Devlin; Neil Lockhart, Kieran Cochrane; Euan Mochrie (captain), Cal Thomson and Mark Caddle. Subs: Adam Scott, Andrew Archer and Duncan McClymont.